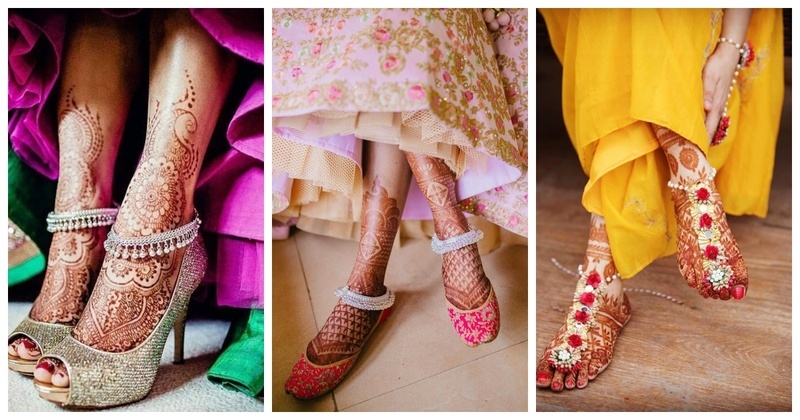 The prettiest paayals we spotted on real brides that you can wear with your lehenga! In the flurry of your wedding your feet are often overlooked. You can’t prance around in heels all the time but there is one accessory that can definitely make your feet prettier. Check out some of the prettiest payals that’ll make you say, “maine payal hai chankai, ab toh aaja tu harjayi, mere saason mein tu hai basa..o sajana!” So what are you waiting for, scroll on and check out these gorgeous paayal that you can wear with your lehenga! A chunky payal will add some drama to your feet and entire bridal look! You can always opt for a delicate and subtle payal and it will still be glamorous! For your mehendi functions a floral payal is a good idea! A statement payal to make headlines? Oh yeah!